between defunct Life and Look. UPDATE: Santo Domingo Pueblo has indefinitely postponed the planned opening for the trading post. We’ll let you know when a new date is set. By the time a 2001 fire gutted the Santo Domingo Trading Post, its heyday as a colorful icon of huckster-heavy salesmanship was long past. 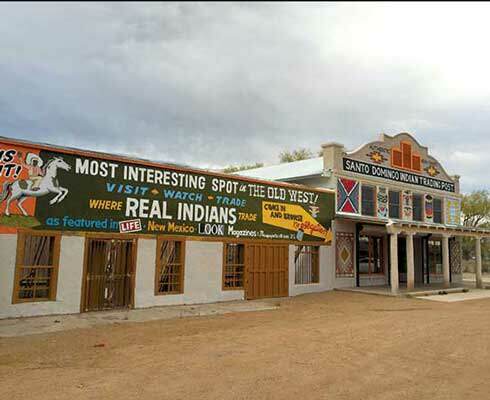 Built in 1881 with double-adobe walls, right next to the railroad tracks, it served the onetime town of Domingo’s 1,000 residents, the artisans of nearby Kewa Pueblo, countless train travelers, and a generation of Route 66 drivers interested in a cool drink or turquoise trinket. The painted façade lured them in with Indian-blanket murals and brassy promises: “Most interesting spot in the Old West!” “Where Real Indians Trade.” John F. Kennedy once popped in. The California Mission–style hulk closed in 1997, then suffered the fire, and, by 2009, seemed destined for bulldozers. But Kewa officials and historic preservationists decided to attempt the impossible. On July 9, the pueblo (formerly called Santo Domingo) celebrates the restored building’s grand re-opening with a day of tours, food trucks, and activities. The New Mexico Rail Runner is selling 140 tickets for a ride with storytellers onboard, a craft workshop in the trading post, and a thumb-sized souvenir pot made by Kewa&apos;s Imogene Aguilar (Holdmyticket.com, while supplies last). Other visitors can take the Santo Domingo Pueblo exit off I-25 and arrive by car. For the long term, pueblo officials aim to fill the post’s hardwood-lined interior with jewelry, pottery, and drums, a coffee bar and Wi-Fi, and workshops on the second-floor balcony. Besides $1.5 million in federal grants, plus architects and contractors versed in adobe reconstruction, help came from pueblo laborers and volunteers such as Massachusetts high-schoolers and corporate executives eager to turn mud and straw into mighty building blocks. Cornerstones Community Partnerships enlisted local students with Keres language skills to survey elders on whether to keep the façade’s comical swagger. After a nearly unanimous “yes,” Kewa artist Ricardo Caté took on the painting task.